Midnight, just a few weeks ago, and I am lying on a remote beach on the west coast of Vancouver Island. High above, the Milky Way pours a torrent of stars across the heavens, more richly painted in pointillist glory than I have ever seen before. In that moment, it feels almost inevitable that of the 100 billion planets orbiting the stars of our galaxy, some must harbour life. Their atmospheres could hold the answer. Over the past two decades, astronomers have identified thousands of ‘exoplanets’ outside our solar system and are beginning to look for gasses that could indicate the presence of life. The science of exoplanet biosignatures may be in its infancy, but it is set to blossom over the coming decade – and chemists will be vital to the quest. The first exoplanet to be discovered around a normal star, initially dubbed 51 Pegasi b and recently renamed Dimidium, was certainly no place like home. 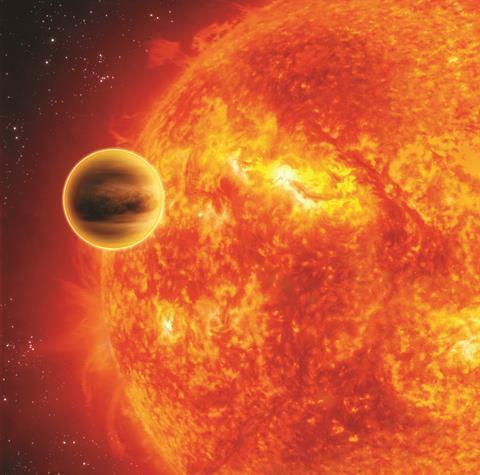 Orbiting shockingly close to its star, it is a ‘hot Jupiter’: massive, scorching hot and blasted by radiation. Since then, instruments such as Nasa’s Kepler space telescope have confirmed more than 3000 other alien worlds, the most common of which are ‘super Earths’, rather like a cross between Neptune and our own planet. Successors such as Nasa’s Transiting Exoplanet Survey (TESS) satellite and the European Space Agency’s Characterising Exoplanets Satellite (CHEOPS) will add to the exoplanet tally when they launch over the next couple of years, before the enormous James Webb Space Telescope (JWST) makes its own trip into space in 2018. Astronomers have already seen water vapour, carbon monoxide and sodium gas in various exoplanet atmospheres by using the Hubble Space Telescope and ground-based telescopes. But the JWST will offer a much more comprehensive view, studying the infrared spectra of starlight grazing through the atmospheres of exoplanets. ‘It will be the first time we can study lots of exoplanet atmospheres in detail,’ says astronomer Sara Seager at the Massachusetts Institute of Technology, US. The JWST will struggle to gather atmospheric measurements from ‘Earth twins’ – rocky planets with a thin atmosphere around a Sun-like star – but it should be able to spend some time observing such planets around smaller red dwarf stars. Understanding the composition of those atmospheres should provide clues about how the planets formed, and whether they could also carry signs of life. Figuring out what those signs might be is a huge task. If a telescope light-years away studied the Earth’s atmosphere, it might see thousands of different gases that were made by living creatures. Arguably the strongest biosignature would be oxygen, because it makes up 21% of our atmosphere – without life, there would be virtually none – and it has a strong, distinctive absorption spectrum. Oxygen is also highly reactive, so its presence would suggest that it is being continually replenished. On other planets, though, oxygen could be produced by purely chemical processes, such as the photocatalytic breakdown of water by titanium dioxide. Identifying how these ‘false positives’ might arise is a major challenge for the field. Astronomers do not simply need a checklist of potential biosignature gases; they also need to identify distinctive patterns of many different gases and their relative proportions that might act as a fingerprint for biological activity. Researchers gathered at a Nasa workshop in Seattle in late July 2016 to start working on these questions. Seager has also been developing an exhaustive catalogue of gases that could appear in exoplanet atmospheres. ‘There’s now a huge role for chemistry in this,’ she says. Firstly, astronomers are hungry for data about the thousands of possible gases they might see. They will need to know possible reaction routes in exoplanet atmospheres, as well as how those depend on the chemical interplay between air, land and sea; the planet’s temperature; and the spectrum of light shining from its star. Chemists can help them to understand whether the presence of certain reactive or toxic gases, in the context of each planet’s unique conditions, simply negate the possibility of life. They can develop models that indicate whether certain patterns of gases are indicative of geological processes, or whether a particular spectroscopic gap in an atmospheric fingerprint might rule a biological source in or out. This will take a collaborative effort that requires scientists to reach across cultural divides between their fields. The data from JWST will be very crude compared with the spectra available to atmospheric chemists studying our own air, for example, with a lot of noise and poor wavelength resolution. It is unlikely to offer anything more than a glimpse into the variety of gases in exoplanet atmospheres, and it will not identify a conclusive biosignature. But by demonstrating that these studies are possible, it could bolster the case for future telescopes that are dedicated to studying exoplanets. And if chemists can work with this imperfect data, and develop models and lab-based experiments to test hypotheses about faraway worlds, they could truly help to explore chemistry’s final frontier.